The scouts urge you to enter an ICE contact into your cell phone! Have you ever heard of this? If so, have you done it? If not, would you like to know the value of it and learn how to list it in your phone contacts? ICE stands for ‘IN Case of Emergency.’ Every First Responder upon arriving at the scene of a medical situation knows that the time used to treat a victim is a precious commodity. First Responders also know that the more information they have about the victim, such as a close relative’s contact number or numbers and any background medical history on the person in need of critical care. This is extremely useful in providing the best medical attention immediately. If the victim is you and you are unconscious, then the ICE contact # listed in your cell phone will provide a great deal of information and could save your life. The paramedics, EMTs, and police officers that arrive at the scene, or emergency room doctors are trained to locate your cell phone and look for the ICE #s in your contacts list. They can call your closest family member and inform them of your medical emergency. By listing a brief mention of your medical history in the ‘Note’ section of your ICE contact, the first responder can treat you accordingly. Now that’s a better outcome for you, to have your closest family member listed in your ICE contact, but think of this: What if your child, spouse, or other person close to you was the victim? Wouldn’t you want to be notified? That is why the CURET T1443 Scouts urge you to also set up an ICE contact # in each family member’s cell phone, as well as your own! There are many apps to use to help you create your ICE contacts and it is a good idea to list at least two names, in case one of them cannot be reached. However, in addition to using an app, you can simply ‘Edit’ your closest family members contact listing by typing in ICE at the beginning of their name. Upon doing so, ICE will appear prominently when your contact list is displayed. These three letters, ICE, are what the first responder will be looking for to make the call to your loved one! It could be that a future First Responder, who comes to your aid, just may be one of your very own CURET Troop 1443 scouts, who once again placed First Place for the fifth consecutive year in the Capital Region of the Mark Twain District Boy Scout First Aid Meet recently held at the Hartford Armory. Why not take the scouts’ advice and enter your ICE (In Case of Emergency) contact # into all of your family’s cell phones? You will be helping yourself in your time of need and the five scouts, Tyson A., Leandre H., Christian M., Brandon M., and Matt B. will know that their ‘Good Turn’ was worthwhile. 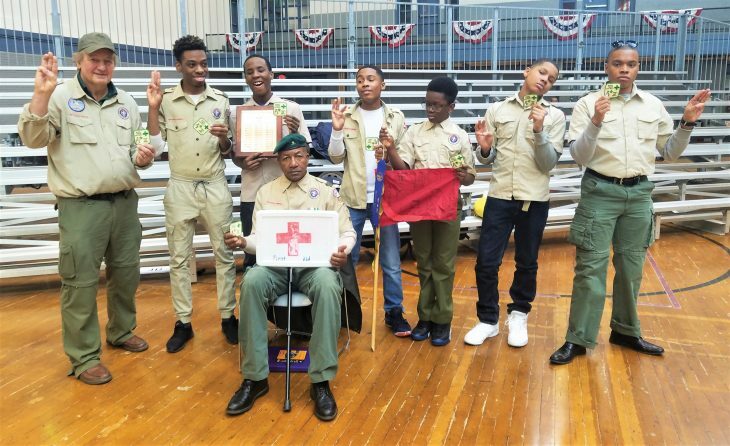 Why not offer the experience to learn a practical life skill, such as First Aid to a youth in your family by joining the Boy Scouts of CURET Troop 1443, located at 1443 Albany Avenue in Hartford CT, or perhaps you, as an adult, ought to consider learning these life skills by joining as well? These five scouts are prepared for a multitude of life-threatening scenarios, because they are members of CURET Troop 1443 Boy Scouts! If you know someone who wants to be part of the challenge to learn a variety of life skills such as: First Aid, knot tying, camping, hiking, leadership, citizenship, character development, personal fitness, and much more, by participating in the opportunities of Scouting in Hartford; Don’t hesitate! Contact Scoutmaster Dean Rhoden (860) 462-5656 email: dl.rhodenggaa@yahoo.com Or Email: ASM Jerry Hancock at hanjth@aol.com, telephone (860) 306-3642. You can also make a financial contribution to enable more Hartford youth to join Scouting. Please make check payable to: Troop 1443 and mail to: Troop 1443, C/O CURET 1443 Albany Ave., Hartford CT 06132. Jerry Hancock is an assistant scoutmaster with Troop 1443 Hartford CT.